Winding down with our 90 Day Basketball Improvement Plan. I hope everyone enjoys the Holidays. As a basketball player you want to be challenged. You want to be pushed. It’s not being yelled and screamed at for losing the ball on the fast break. It’s not a coach getting in your face and dissin’ you. It’s a coach motivating you. Getting you to play your very best. You will never know your true capacity for achievement on the basketball court if you never challenge yourself or are challenged by not only your coaches but your opponents as well. Competition brings out the best in all of us. The first and worst of all frauds is to cheat yourself. Not allowing a coach to coach you in a positive way is stopping your progress. The players who have a hard time with a coach raising their voice is someone who has a very high opinion of themselves, and is selfish. I think it’s a cop-out when players get sensitive to a coach coaching them up. I totally believe that there is a powerful, driving force inside every human being that, once unleashed, can make any vision, dream or desire a reality. Change for a player is difficult, it always is. Change in any venue is difficult. When you relocate, when you go to a different school, work at a new job, it’s all the same. It’s how you were brought up and taught how to respond to change. A lot of players fight it, some respond, some, it doesn’t seem to bother. Crave coaching. Demand it, look for it, learn to love it. Compete, battle, jump in the ring. Work on your weakness, take time to shoot 100 3’s a day in the summer. Go up and down the court with your left hand. The desire to become the best player you can possibly be must be discussed when asking ‘how good do you want to be’. A positive push is better than a negative shove. Too many basketball players buy into the hype. They read their name on some kind of scouting service report or they fall in love with their name in the newspaper. Like Chuck D once said, ‘Don’t believe the hype’! Donnie Jones is in his first year as men’s head coach at the University of Central Florida. He’s one of the good guys in the coaching business. His team is off to a 10-0 start which includes some big wins (Florida, South Florida and Miami). In this article, from an Orlando Newspaper (The Sentinel) Coach Jones doesn’t want his players to get too hyped about all the props they are getting. The same should hold true for you, the player; stay grounded. Don’t get too high. As good as you are playing, don’t listen to anything people say; it’s all hype. You’re only as good as your last game. Keep working hard and don’t pay attention to the rankings, the pats on the back or newspaper articles. DAY 85: HOW DO YOU PREPARE? One thing I love is receiving handouts from other coaches. This week I got something very good in terms of preparation for players, from Ohio University. Day 85 – Do You? Do you get 7-8 hours of sleep the night before a game? Do you review your playbook? Do you read your opponent’s scouting report? Do you meet with your athletic trainer if you have any nagging injuries? Do you arrive early to avoid the risk of getting stressed over traffic, bad weather, or a flat tire? Do you visualize playing well before the game begins? DAY 84: DRAW A CHARGE! I’ve been holding off on final days of the 90 Day Basketball Improvement Plan…I hate to see all good things end. The feedback has been great, thanks to all who have taken the time to write. For the last couple of days I have seen great players step in and take a charge to help their team. Manu Ginobili of the San Antonio Spurs stepped in the lane last night against the Denver Nuggets on Carmelo Anthony and drew the game-winning charge. Here’s the clip from last night. One of my top players has taken 2 charges in our first two games…I am so proud of him. Drawing a charge on defense seems to be a lost art. Why more players don’t step up puzzles me. It takes a special player to want to give up their body for the good of the team. It takes courage, toughness and ability; the ability to set your feet, and know exactly when to step in. Seems like Phil Jackson of the LA Lakers rewards his players when they take a charge. The charge-taking competition, however, has yet to involve Ron Artest, who said he learned from growing up on the New York playgrounds, that when you take a charge, fall and then call an offensive foul, well, bad things — like serious bodily harm — can happen. I wish more players would step up and draw a charge. I watched the Boston Celtics and Philadelphia 76ers last night on TNT and it amazes me how Ray Allen of the Celtics continues to make big time shots late in the game. Taking and making shots late in the game is a gift. I’m talking a gift in terms of someone having the courage to step up and take it. And of course, living with the results whether you make it or miss it. Miss it and you will have critics. Make it and they will love you. Are you a player who is not afraid to step up and take a big shot? During his playing career at Duke University, Christian Laettner gained a reputation as a clutch shooter. Do Kentucky fans need to be reminded of that? Most famously, his buzzer-beaters beat the Wildcats and Huskies in the 1991 and 1992 NCAA tournaments, respectively. In 1991, Laettner made two big free throws with 12 seconds left to give Duke a 79-77 win over UNLV in the National Championship. Laettner played in four final fours, winning two and is the all-time leading scorer in tournament history. Don’t be afraid to step and take the last shot…if you are confident, you will make it. If you don’t, live with it and move on. Winding down on our 90 Day Basketball Improvement I have decided to buck the trend a bit. We’re going Lacrosse today…words from one of the most inspirational coaches to ever work the sidelines. Diane Geppi-Aikens passed away in 2003. 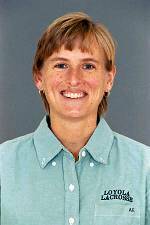 She was the head women’s Lacrosse coach at Loyola of Maryland. When I heard about her story, I became a huge fan. She battled terminal brain cancer and all through her battle, she was so inspirational to all around her with her determination. “I can tell you honestly that I never have asked, ‘Why me? '” she said. “Now, I am not going to tell you that there haven’t been some incredibly frustrating moments or that at times when I have been alone that it hasn’t been very difficult or that I haven’t gotten down. Instead, Geppi-Aikens said she has focused on all of the things that she has. She has tried to keep a sense of humor. She has tried to keep things in perspective. Her children, her family, her team, her school, her fellow coaches have helped her to do that. She also has taken the opportunity to be an advocate for those with brain cancer. She has taken every opportunity to speak to those who are beset with the same illness. She is doing that, on top of other commitments in the community regarding youth sports and other service activities.